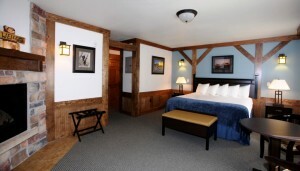 We have three “Luxury King Rooms” all located on the second floor. The Luxury King rooms will comfortably sleep two with the option of a cot for an additional guest. When you walk out your door, all the shopping and dining downtown Estes Park has to offer is within easy walking distance. Enjoy our highly praised Simmons Pillow Top Beautyrest Mattresses and get a good nights sleep. Call to Book: 1-970-449-1660 or use our online reservation system. Extra towels and pillows are standard at “The Haber Motel“.